Jade Is The New Black is gorgeous! This is the only one from the Hong Kong collection I picked up and I'm glad I did! I'm wearing 2 coats with 1 coat of Seche Vite. I wore this for 4 days (2 normal and 2 konaded) and not a chip in sight! I can't get enough of this color. I've been disliking my lamp pictures lately! So here is a flash shot. 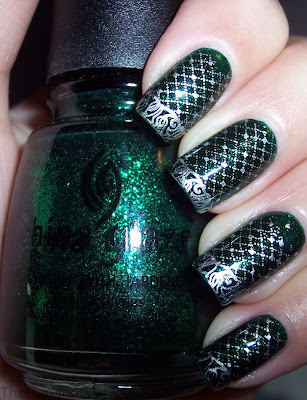 Today's notd is 2 coats of China Glaze Emerald Sparkle with Millennium as the stamp color. I got 4 new plates (finally, right?) but 2 were backordered so hope I get them soon. This is plate m71.